He won with a godlike combo, got invited to a tournament, what could go wrong? Jaden loves to play Cross Ups, a popular video game, and he’s really good at it. So good at it that a competitor that he smacks down with a godlike combo asks him to attend the T3 video tournament and even offers to waive the entry fee. There’s just one problem, his mom won’t let him play video games. Soon Jaden isn’t just hiding his video games, he’s lying about tutoring sessions, planning to sneak off to a tournament, and pretty much weaving a web of lies that’s spinning out of control. But Jaden want to win the tournament even more when he discovers that the prize is two thousand dollars – something that could build a wheelchair ramp for his best friend Cali’s mom so she doesn’t have to move to Montreal to live with her dad. This is an immersive story that pulls you right into middle school, complete with BFFs, frenemies, bullies, and quirky teachers that really champion kids. Can Jaden convince his mom to let him attend the tournament? Can he help Cali and her mom out? Or will he freeze and choke with all his schoolmates watching as he’s streamed live on Twitch? There are good lessons and conversations in this story, from the debunked theory that violent video games cause violent behavior (only if a child is already prone to violence), bullying, friendship, honor, the consequences of lying, the meaning of family, and much, much more. Kids and parents alike can enjoy this book and share experiences. 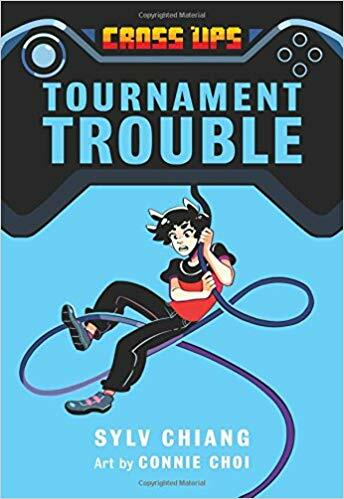 Highly recommended and enjoyed as a fun, fast read that will appeal to a wide range of readers, including reluctant readers, and especially gamers. All twelve-year-old Jaden wants to do is be the best at Cross Ups, the video game he and his friends can’t stop playing. He knows he could be―if only he didn’t have to hide his gaming from his mom, who’s convinced it will make him violent. After an epic match leads to an invitation to play in a top tournament, Jaden and his friends Devesh and Hugh hatch a plan to get him there. But Jaden’s strict parents and annoying siblings, not to mention a couple of bullies and his confusing feelings for his next-door neighbor Cali, keep getting in the way!